This past year for the first time John Stossel taped his Fox Business show at FreedomFest, using their theme “Are We Rome?” Fox News aired his FreedomFest show five times! 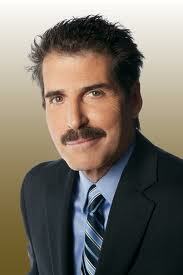 Stossel and Fox News intend to return this year. 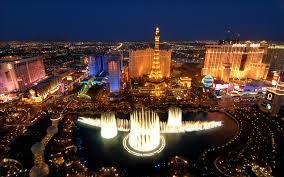 FreedomFest has two co-ambassadors, Steve Forbes and John Mackey (co-CEO, Whole Foods Markets). They plan on attending all three days in July. Other regulars include Steve Moore (Wall Street Journal), Sen. Rand Paul, Peter Schiff, John Allison and David Boaz (Cato Institute), Nick Gillespie (Reason), Grover Norquist (Americans for Tax Reform), Dinesh d’Souza, Doug Casey, Charles Murray, Lawrence Reed (Foundation for Economic Education) and too many more to name. FreedomFest attracts over 100 speakers and exhibits every year. Not only will you have a chance to attend sessions given by these folks, you’ll also sit with them as they attend sessions themselves. They don’t hide out in a speakers lounge. You’ll meet them in the halls and in our popular Exhibit Hall – a place buzzing with excitement and bubbling with ideas. Is Big Brother Here? – Presented by FreedomFest from Smooky on Vimeo. This year FreedomFest has an exciting line-up of new speakers, including libertarian humorist P. J. O’Rourke, historian H. W. Brands, science fiction author and futurist David Brin, and economics professor extraordinaire Ken Elzinga, plus many more to be announced shortly. FreedomFest is also planning a Big Four panel, “Can Think Tanks Make a Difference?” with the presidents of the four most influential libertarian think tanks in the world: Reason (David Nott), Cato (John Allison), Americans for Tax Reform (Grover Norquist), and London-based Institute for Economic Affairs (Mark Littlewood). The producers of FreedomFest, Mark Skousen and Tami Holland, also planning sessions on the anniversary of World War I, current geo-politics, economics, investing, health and healthcare, history and philosophy, science and technology, literature, music and the arts. Plus, if you register for FreedomFest today, you have the opportunity to support HACER! Use the code FF14HACER when you register, and HACER will receive a 12% contribution from the registration price. 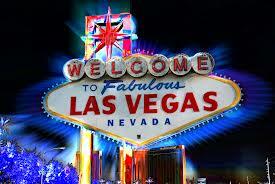 Make your plans now to attend FreedomFest, July 9-12, 2014, at Planet Hollywood in Las Vegas. Register before March 15, 2014 and receive the Early Bird discount ($100 off). And use the code FF14HACER, and HACER will receive a 12% contribution from the registration price. 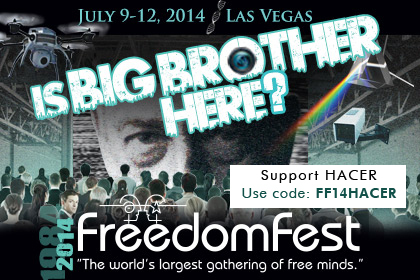 Register today with code FF14HACER at www.freedomfest.com/register-now or call Tami Holland, the conference coordinator, at 1-866-266-5101. 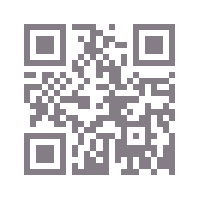 This entry was posted on Monday, February 24th, 2014 at 6:40 pm	and is filed under Events. You can follow any responses to this entry through the RSS 2.0 feed.